On this site you can read a description of my new book, view the contents page and read an extract. You can order a copy via Amazon or Waterstones. If you are a public sector body, company, university or training provider interested in bulk purchases then please contact Jane Davies at Kogan Page. You can also follow me on twitter @alsteve1 and read latest blogs and articles. Recent blogs cover: age, outsourcing, how to answer the impact question and a story from Michael Bloomberg about how he encouraged innovation. 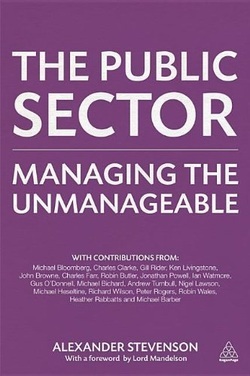 And there are links to articles written for the Guardian, Public Servant, Public Sector Executive, and Ethos. A special page has been reserved for the long piece I wrote for the RSA Journal on Lust and Public Policy. Finally, you can see what services I offer and, if you have any comments or questions about the book or wish to enquire about my availability as a speaker or consultant, then you can contact me here.